One of the more rewarding aspects of being involved with Ulman is the people we come in contact with on a daily basis. People who commit to helping and supporting others, many of whom they may not ever get to meet face to face. One of our programs that thrives on the kindness of strangers is the 4K for Cancer. Each year nearly 150 college-aged men and women set out on a cross-country journey to raise money for our organization while having the adventure of a lifetime. Six teams of participants ride their bikes or run, from city to town to neighborhood across the country over the course of the summer. In order to make this possible, we secure hosts in each location asking only for a free and safe place to sleep for our teams. In many cases, a roof and floor is only the beginning as our 300 hosts go out of their way to make sure these remarkable participants are taken care of along the way. Pam Wrucke is one of those unbelievably generous hosts. Pam is someone who thrives on staying busy and taking in all life has to offer. When I had the opportunity to speak with her she was in the process of helping her 88-year-old aunt grocery shop, something that has become her Friday tradition. Every Sunday evening Pam flies to Milwaukee, WI for a week of work and then flies home to Evansville, IN on Thursdays in time for Friday grocery shopping. She enjoys the travel and time in Milwaukee, where she used to live and has family, and especially enjoys her work consulting in the field of Health IT. Pam recently celebrated her 30th wedding anniversary to her husband Wes, a school principal in Louisville, KY (who also commutes weekly), and is the mother of two children, a son Connor and daughter Christian. Connor and Christian both live in Indiana as well, Connor works as a Warehouse Manager and Christian is in school at Indiana State University. In addition to being a wife, mother, and traveling consultant, Pam still finds time for physical fitness. Pam began running as a means to lose weight and focus on fitness. She jokes that her first half marathon was something she completed only because she was following the training program anyway and figured she may as well do the extra couple miles. She conquered the Evansville Half Marathon and lost 50 pounds in the first year of her fitness journey. Now, seven years later, 100 lbs. lighter, she has completed 20+ half marathons, 2 full marathons, and last fall did her first Tough Mudder at the age of 55. Pam reflected fondly on the Tough Mudder resulting in a forced confrontation of her fear of heights. She credits a group of friends and her Orange Theory Fitness family for her continued commitment, many of them run races together all over the country, including Pam’s personal favorite, the Louisville Half Marathon. If Pam was not busy enough, she still finds time to volunteer at her church, Immanuel Lutheran, in Evansville, IN. Her commitment to making meals for congregational events and families in need is how she eventually intersected with the 4K for Cancer. Six years ago a 4K run team was first scheduled to stop in Evansville and stay at the church. A member of the congregation, Christy Jones, was recently diagnosed with colon cancer and video conferenced from the hospital with the team. Pam reflected on the impact that team had on Christy and how many of the team members dedicated runs for the next several days for Christy. Unfortunately, shortly after their visit in July, Christy ran out of time in her battle with cancer. When the team first came through Evansville, they were only there for one night, no rest day or service day was scheduled, but that changed, and a service day now accompanies the stop. 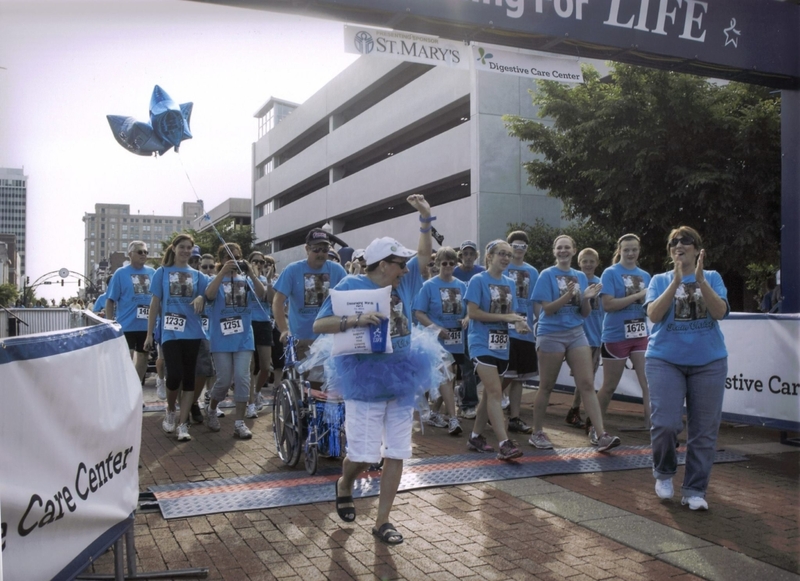 Stories of Christy, Pam, and Evansville’s generosity and kindness is passed from team to team. One year the team was scheduled to stay in Evansville on July 24th. The team called ahead to ask Pam if it was okay if they celebrated Christmas in July, a 4K tradition, during their stay. Pam immediately set out to play her part. 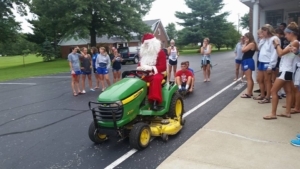 She pulled out the Christmas tree, purchased candy canes, and even enlisting a member of the congregation to dress as Santa and offer sleigh rides in tow of a John Deere tractor. When the team is not celebrating Christmas in July, the congregation hosts an annual bonfire to welcome the team. Knowing the 4Kers very well, the congregation is all encouraged to bring their dogs to help welcome the team. Pam epitomizes the values of Ulman: Be Human, Be Better, Be Courageous, Be Committed. 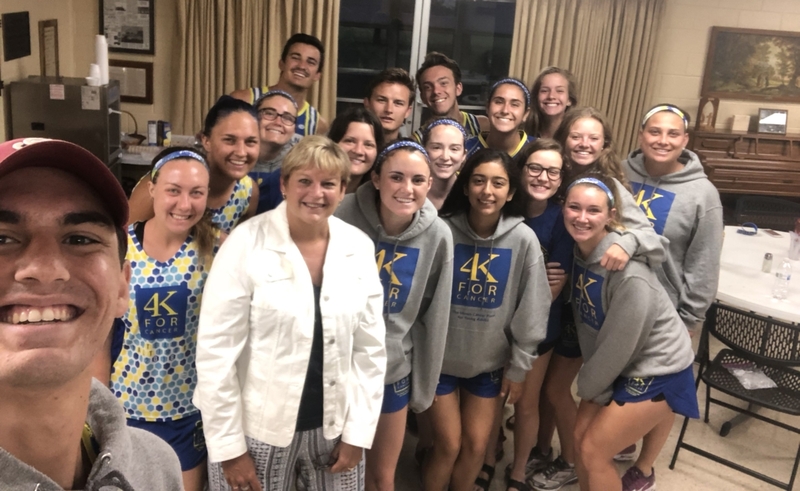 Now having wrapped up her annual 4K host duties and sending a full and cheery Team Baltimore on the last leg of their journey, Pam is preparing for a journey of her own.